Enter to win this awesome Skinny Pack from It Works Global! The Skinny Pack has all the tightening, firming, and defining of the Ultimate Body Applicator and Defining Gel, plus the fat and carb fighting powers of Advanced Formula Fat Fighter. Absorb less fat and carbs even after you’ve eaten them! 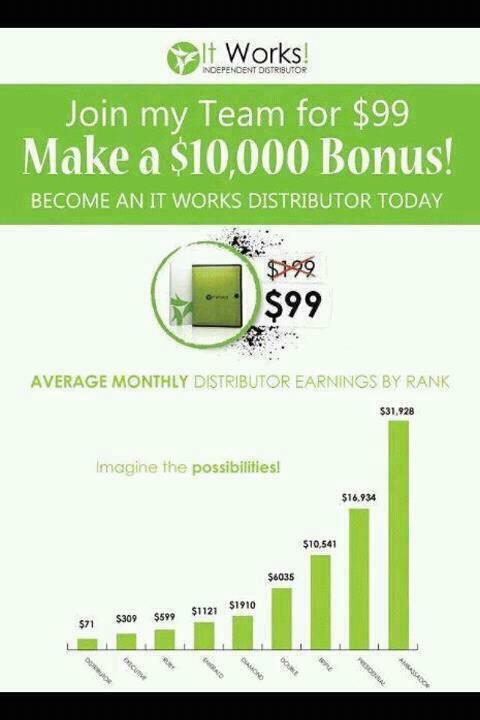 It Works Global also offers a fabulous opportunity that will change your life! Make one decision that will transform your life and become a distributor of these great products! When you launch your career with It Works you get the opportunity to be your own boss, work from home, and it will open the door to providing you with an unlimited income! Learn more about It Works and how it can change your life! This is a limited time offer and ends soon, but ask me how you can earn a $10,000 BONUS to sign up as a distributor! Enter to win your very own Skinny Pack below! Giveaway is open worldwide, 18 years of age and older. Giveaway ends July 9 at 11:59 pm EST. Good luck! Giveaway Bandit contains endorsements for products and services, which means when you click on a link that I recommend, I may receive a commission. Not every link is an affiliate link. Giveaway Bandit is in no way sponsored, affiliated, or endorsed by It Works! Global. However, the owner of Giveaway Bandit is an independent distributor of It Works! I can be skinny in 45 minutes! I would love to win this. Thank you. The defining gel helps get rid of stretch marks. Thank you for the giveaway. I learned “It Works” has most than just wraps, they have whole systems! who knew? I learned a new great way to lose weight. I learned you only have to wrap for 45 minutes to see results! amazing!!! I would love to be skinny in 45 minutes!! I learned that this stuff really works! Thanks! I learned that It Works is one of the fastest growing companies in the US. I learned that it has all natural ingredients. I learned how fast I could lose weight- perrrrrrfect!!! I learned now quickly it is to see and feel results. I would love to try this! The defining gel helps get rid of stretch marks?! AWESOME! I learned that it is naturally based body contouring line that delivers maximum results in minimal time. I learned that it starts toning and firming in as little as one application and that its not just for your mid section but for you thighs as well. learned you only have to wrap for 45 minutes to see results! they have products to help with stretch marks and also firming. i hate stretch marks! That they also sell face creams, eye lift creams, and other stuff that I didn’t know about! They also have a product called Greens, a delicious orange-flavored, alkalizing drink powder with the nutritional value of 8+ servings of fruits and vegetables in each serving. you can tone, tighten and firm in as little as 45 minutes! I read the testimonies of real people with REAL results. With the Ultimate Body Applicator you can tighten, tone, and firm in 45 minutes. That you only to wrap for 45 minutes, to see results! That would be great! Save up to 45% with the loyalty program. I learned that it works and in only 45 mins!! I learned that It Works! started in 2001. They have gel for stretch marks! This is what I found out…The It Works! Ultimate Body Applicator has been featured in the Emmy® and Oscar® Awards celebrity gift suites, as well as promoted by celebrity makeup artists on movie sets. I learned the Defining Gel decreases the appearance of varicose veins! Too bad it’s WAY out of our price range! A great thing about becoming a loyal customer is that you get the products for up to 45% off! They are so worth it! Luis Mijares, the formulator behind the It Works! body contouring and skin care products. He is well known for working with natural ingredients. I Learned that It Works! I learned that In 2011, It Works! was ranked on Inc. Magazine’s prestigious Inc. 500/5000 list as one of the 50 fastest-growing companies in its category. Thanks for the giveaway! The stretch mark cream is moisturizing. I learned that the gel will help stretch marks! It seems awesome.. i need to use it first then i can be able to say something.. It can work in 45 minutes! I learned that on July 14th the It Works will be at the Double Tree in Seattle. You could have a “Wrap Party!” What fun! I learned quite a bit. It takes 45 minutes to start the process off right but it will continue to work even after the wrap has been removed. Helps to absorb fat after you’ve taken the pills. Balances blood sugar level! Being a mother of 5 kids it would be great to win this and lose weight in as little as 45 minutes. I’ve learned that It Works not only makes body wraps, but they also make products for aging facial features, which I would love to try out! I learned that you can see results in as little as 45 minutes. I learned there is a doctor involved which makes me feel a little better as I am always skeptical about these things. I learned it only takes 45 mins. I learned that in little as 45 minutes it will work to tighten and tone, leaving visible results. I totally want to win this! I didn’t know they had products for menopausal symptoms. I’ve learned that the Ultimate Pack would be ideal for my weight loss. You should try it! You can get a box of wraps for $59 at It Works! It’s the Worlds first body contouring solution of it’s kind. I leasrned that they have put these in celebrity gift baskets at awards shows, lol! I learned that the wraps can be used basically anywhere and you can lose inches in specific problem areas and you can also make a living doing it as well. Amazing I would love to try it especially after having a baby. tightening, toning, and firming results in 45 minutes!! I’ve learned that In 2011, It Works! was ranked on Inc. Magazine’s prestigious Inc. 500/5000 list as one of the 50 fastest-growing companies in its category. I found out in 2011, It Works! was ranked on Inc. Magazine’s prestigious Inc. 500/5000 list as one of the 50 fastest-growing companies in its category. “it works” noticeably in 45 minutes. real people CAN lose weight!